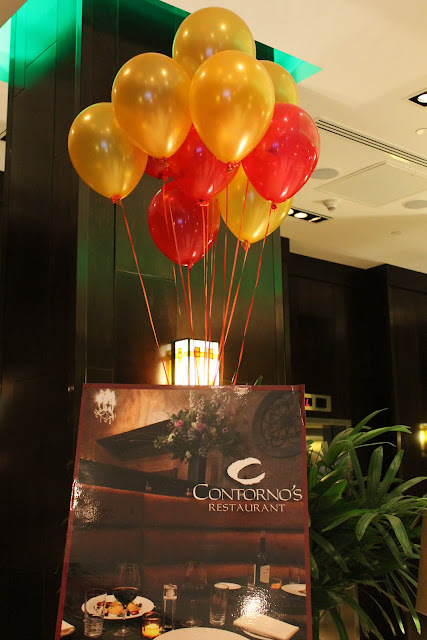 It was a week and a half ago that my sister and I attended the opening of Contorno's Restaurant, and I am still thinking about how great the food was. Contorno's Restaurant is a rustic Italian restaurant located near Herald Square. The event was done very well, with such a smooth flow of passed hors d'oeuvres, that we were rarely left waiting for the next dish. Crostini: Gorgonzola & Fresh Honey Comb on Toasted Raisin Walnut Ciabatta. A terrific appetizer of sweet & savory on the freshest lightly toasted ciabatta. Old Fashioned Chicken Veal Meatballs served over a chick pea puree, finished with a veal reduction. So deliciously tender and juicy. Most definitely comparable to the meatballs I adore at Beauty & Essex. Home made Spaghetti with GrandMa Buico Tomato Sauce. Home made spaghetti is such a lovely comfort food. The al dente texture was so perfect. My sister was addicted to this dish. Milk Chocolate & Pistachio Tart. I couldn't really taste the pistachio in this, but the milk chocolate was delightful, and the tart tasted home made. It crumbled exactly how fresh tarts should, and even though my sister and I agreed to split this, I probably finished off two thirds of it. New York Cheesecake. And yet another outstanding dessert. I'm not even such a fan of cheesecake, but this really knocked my socks off.